Northamptonshire county border village, the river Welland forms a boundary with Leicestershire. Local records indicate that upto the early 16th. century, the church had a small spire but this was removed & the upper portion of the tower rebuilt to a very noticeable height of 71 feet as per what we see today. To the right of the car parking area is an information panel regarding an English Civil War encounter in the aftermath of the battle at Naseby 1645. Benefice:- Marston Trussell, Sibbertoft & Welford. Treble. 2012. Eijsbouts of Holland. (3-0-27). 2nd. 1621. Hugh II Watts. 3rd. 1622. Hugh II Watts. 4th. 1612. Hugh I Watts. 5th. 1622. Hugh II Watts. Tenor. 1959.John Taylor & Co. (Wt.10-0-14). Treble sally colours : blue / gold. Sunday service ringing subject to available ringers. Lighting ought to be brighter. Cold and damp during winter months. Conventional stay on treble bell. Hastings stays on No’s. 2 to 6 bells. 1) Level access path to the north porch from car park & road. One step down to porch, then four steps down into the nave via north door. 2) Level but grassy path leading down to south door, followed by one step up into nave. Limited “off road” car parking adjacent to Church gates. 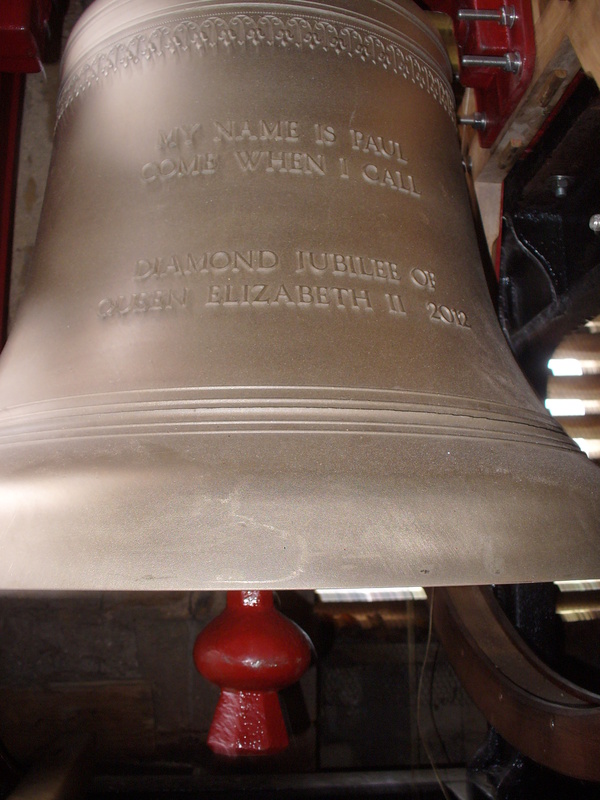 A new treble bell, cast by Eijsbouts, (with headstock & extra frame engineered by Taylors, in order to compliment their existing framework), was added to make a ring of six in December 2013 & installed by local volunteers & bellringers. Hugh II Watts cast a tenor bell in 1623, it became cracked & was subsequently re-cast in 1959 by John Taylor & Co.
Jesus of Nazareth, King of the Jews, O Son of God have mercy on me. Marke Brewster gave this bell. Inscriptions, (pre 2013, ring of 5 in brackets). Marston Trussell’s new treble bell was installed late 2013 into an existing John Taylor & Co. 6 bell iron “H” frame assembly. 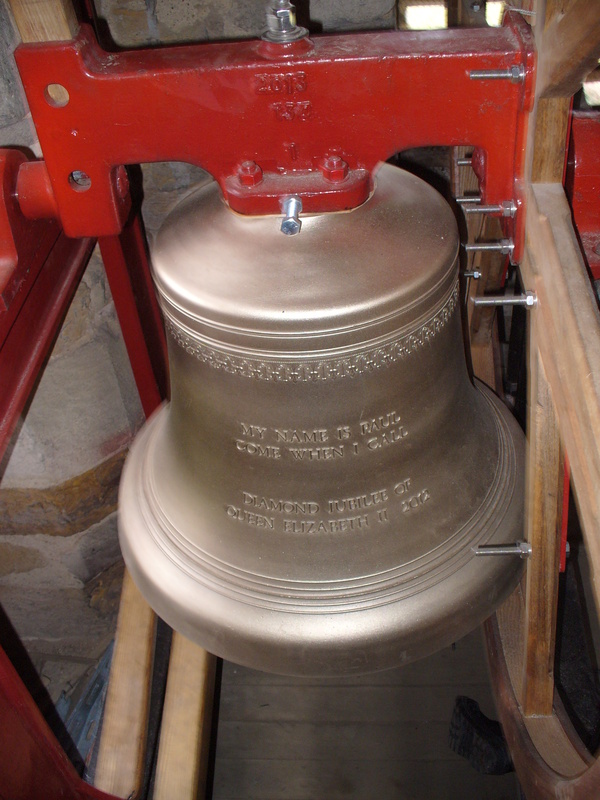 The completed ring of 6 bells were sounded out on Christmas Day, 2013. The bell was cast in 2012 by Eijsbouts of Holland (Wt.3-0-27), then taken to John Taylor & Co. of Loughborough for fitting of the headstock.